I’ve been prepping for market for what seems like forever now. Along with sewing samples for my own booth, I have also been asked to make samples for some the manufacturer’s booths. 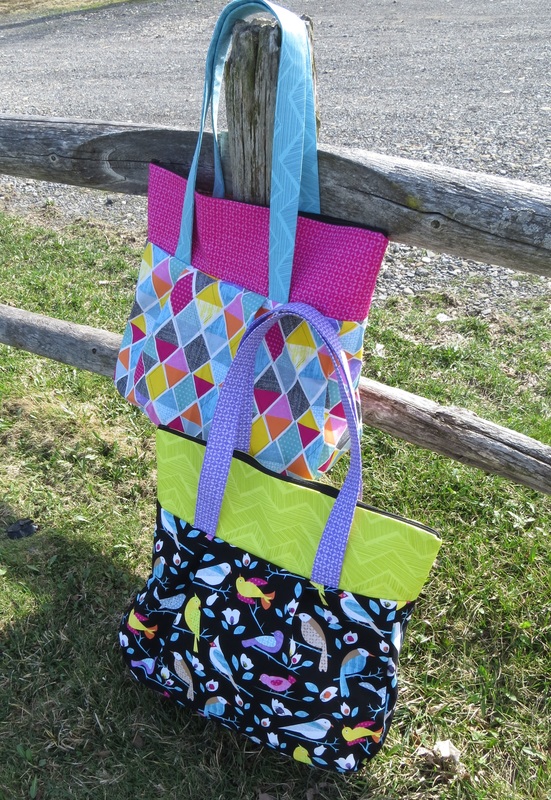 When Hayden from Timeless Treasures asked if I would make some Getaway Bags for their booth I said yes of course! I got to play with the new Field Study by Alice Kennedy. I thought I would include some tips for making this giant tote bag along with the finished pictures. This bag is one of my favorites. It’s loaded with pockets – 2 sets of divided pockets and 2 zippered pockets. The top also has a zipper to keep everything tight inside. For anyone who sees the phrase “zippered pocket” and runs away as fast as they can, this post is for you! Zippered pockets are not as scary and you may think and I speak from personal experience. When I sold custom bags I used to tell my clients that they didn’t need zippered pockets, or zippers of any kind for that matter. Once I figured out that they were easy, I was hooked! 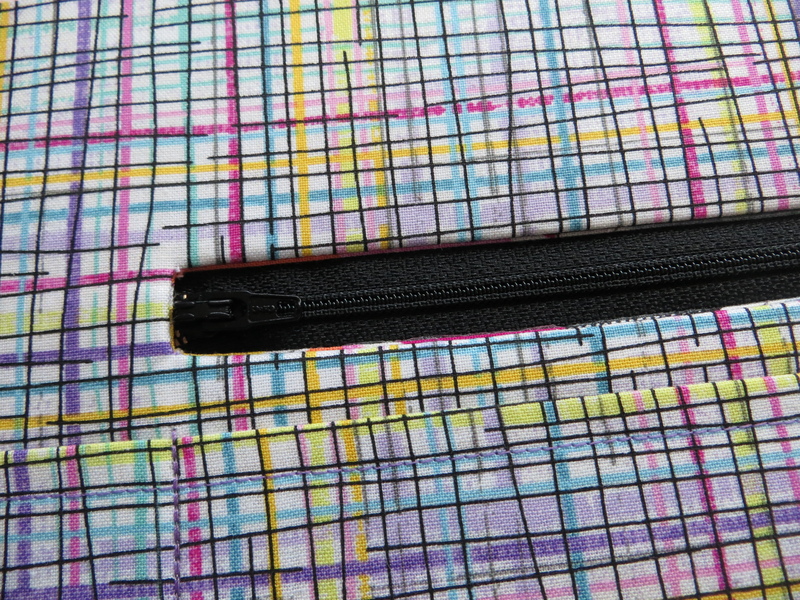 Before adding the zippered pockets, you will add the divided pockets (see step 4 of your pattern). 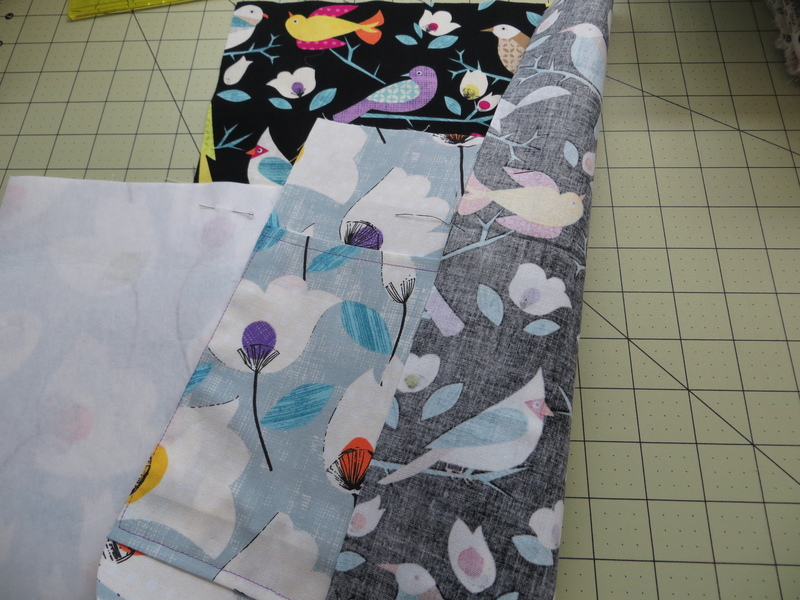 After these have been sewn into the lining and divided, you’ll be ready to prepare the zippered pockets. 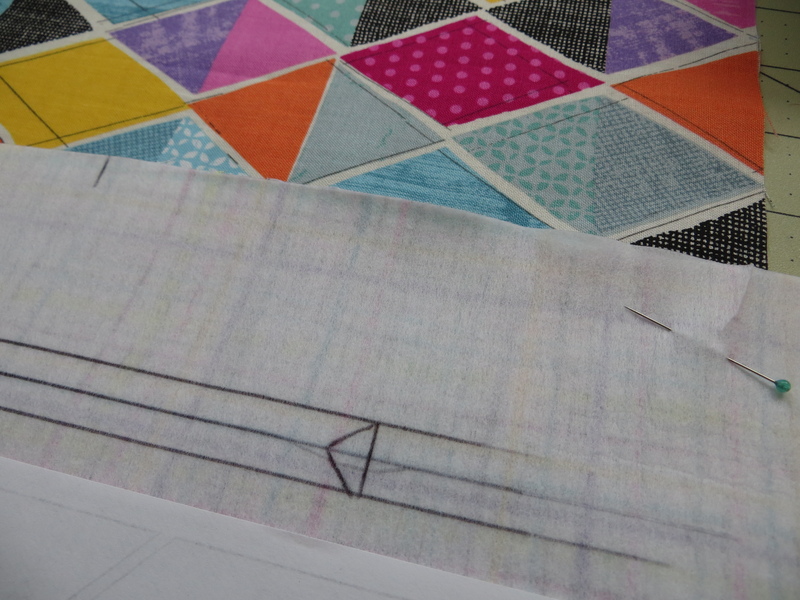 First, draw the rectangle explained in Step 5 on the interfacing. This will later become the opening that will hold the zipper. As you can see from my picture below I used my ruler to draw the lines. The “V”s on the end don’t have to be perfect or drawn with a ruler though (mine are far from perfect). Just don’t make them too small. After you’ve drawn the box you’ll be ready to pin the pocket piece in place (right sides together with the lining) and sew around the outside of the box. Pinning the pocket at the top and bottom is extremely important for this step. You’ll be sewing on the interfacing side and wont be able to see if the pocket has folded so be sure to pin, pin, pin!! It doesn’t matter if your lines are perfect since it’s on the inside! The pocket is pinned right sides together with the lining. Next, after you have sewn around the outside of the box you will cut the opening in the center. I can’t emphasize this enough – do not remove the pins yet! You can accidentally cut the pocket if you remove the pins so don’t remove the pins yet!! 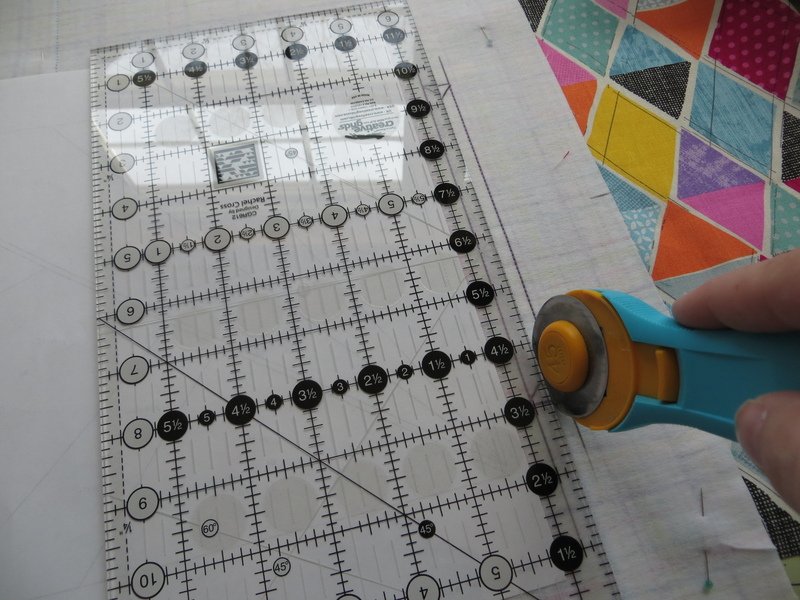 Cut on the center line with your rotary cutter (scissors if you prefer but I like my rotary cutter better). Cut from the point of one “V” to the point of the other “V”. Using sharp scissors cut the “V” back to the sewing line. If you don’t cut all the way back you can get wrinkles or puckers in the corners of your pocket. If you’re not comfortable cutting with your rotary cutter you can use scissors. If your cutting isn’t exactly on the line, that’s ok too! 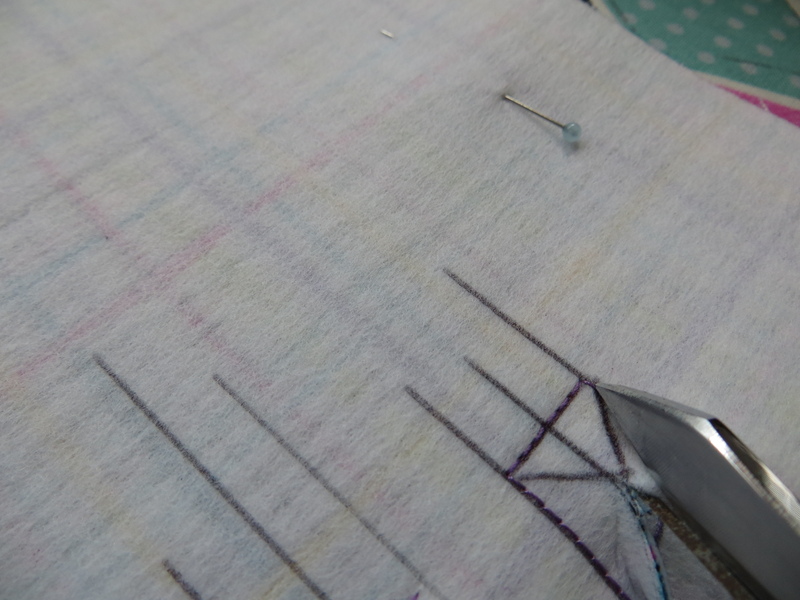 Be sure to cut all the way back to the stitching line but not through the stitches! After cutting the opening, pull the pocket fabric all the way through to the interfacing side. Press the opening really well, making sure it’s clean and neat. This is where your zipper will go. Again, pin the pocket fabric at the top and bottom so it’s not sewn into place incorrectly. And now the magic happens! 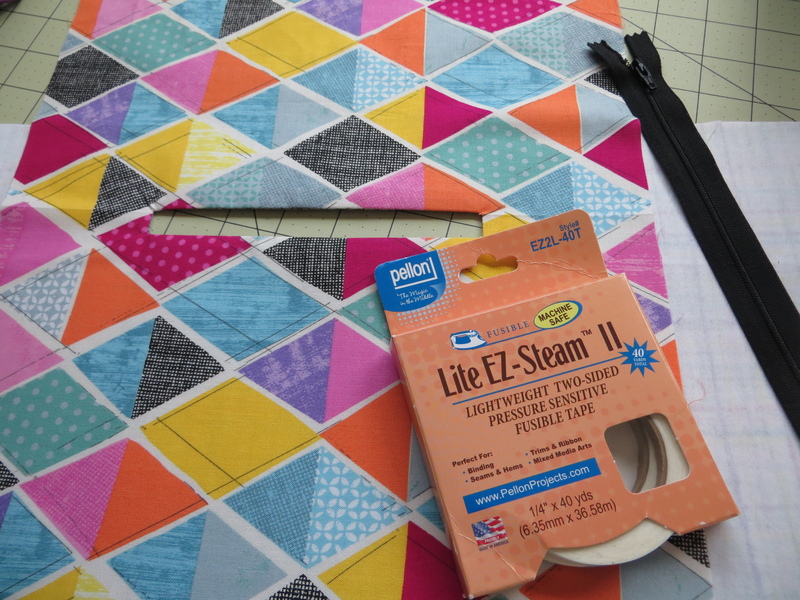 Using Pellon EZ Steam II Tape, add strips to either side of the pocket opening. This will be on the pocket fabric itself, on the inside of the bag. Note: You will want to use the 1/4″ wide tape NOT the 1/2″ wide – it’s too wide for this technique. Fuse the tape down with your iron and peel the paper off when cool. Place on top of your zipper and fuse into place. Stitch around the zipper about 1/16″ from the edge of the fabric. Close the pocket in the back and voila! You just made a zippered pocket! Not too bad right?? 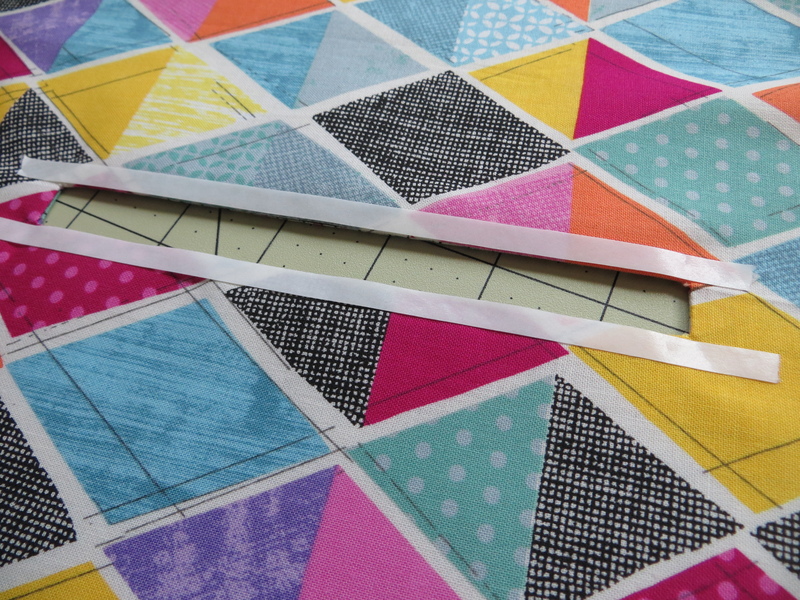 This fusible tape is like magic and will change your view on zippers forever! Fuse tape to either side of the pocket to hold the zipper in place instead of pins. Once your zipper is fused in place (yes you iron right over the zipper) you can sew around the outside to secure it in place. Sew as close as you can to the edge of the fabric. If you would like to order your own copy of the Getaway XL Tote bag you can do so here or here. If you plan to be at market be sure to stop by the Timeless Treasures Booth 1346-47 or my booth 1641. Hope to see you there! Oh, almost forgot, here are the finished bags! I love, love, LOVE how they came out! I am in love! Do I have to send them away? Love the birds! I definitely need some.